As you get ready for the start of the week, and we launch into the new year, let me bring you some beautiful imagery to inspire you. Get your coffee, load up your emails and take a moment to sit back and enjoy a little visual story. This is just the first of many. I caught my breath when I first saw this photograph by Lisa Vanden Berg. 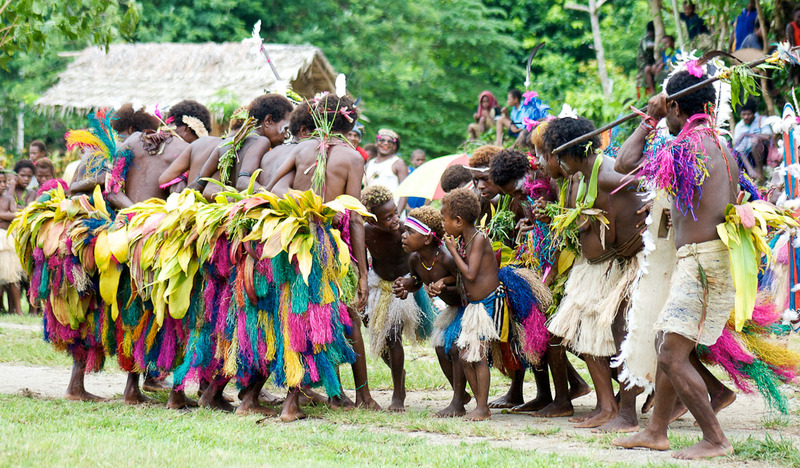 I’d found many beautiful images from the Lote New Testament Dedication in Papua New Guinea, but this one perfectly captured the intimacy of the community celebration, and shows a little about life in PNG. How I delight in the brightly coloured skirts and the bare backs of the women, the soft fuzzy background of jungle, thatched roofs and smiling onlookers. I can’t help but wonder.. what are they saying? why are all the adults listening to the children? are they singing? chanting? telling a secret? See their hands clasped so tight, like a big family. What a fabulous idea Elyse…love this photo! For me it brings back many memories and inspires me to continue on so that this photo will be repeated in many other language groups! Thanks for sharing it! What a great natural shot of people fully immersed in celebration! The best shot I’ve seen of the dedication, a language project in the Islands region I didn’t get to visit due to it’s remoteness. Thanks for sharing it. Brilliant idea and a great article! I know people who would love it if I forward this to them. Keep those creative juices flowing! Wish you a blessed 2011.